Do you love your customers, but think it’s a bit over the top to send them a Valentine card festooned with candy hearts? Well, you’re probably right. Why don’t you create a Valentine’s Day giveaway and share some of your favorite products or services instead? I’m head over heels for this week’s Campaigns – two out of this world Valentine’s Day giveaway ideas and an awesome spring-break travel contest. Help your customers find the perfect gift this Valentine’s Day by creating a gift finder. 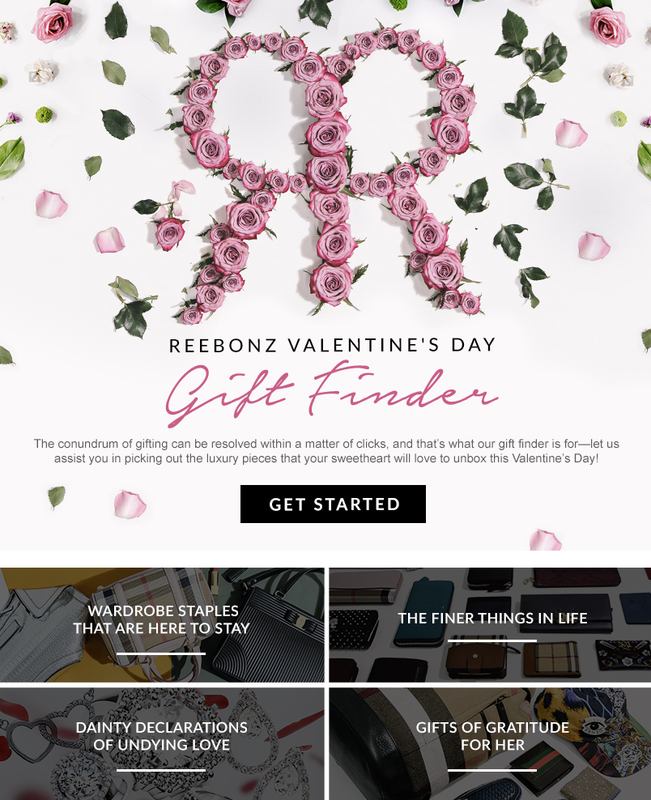 The gift finder Reebonz built is a fantastic example. Shoppers choose their favorite brand, color, and product category and then Reebonz reveals recommendations for luxury presents, which can be purchased on the Reebonz website. TIP- Reebonz uses Action Widgets to trigger different Container Widgets to display based on the link the user clicks. However, you could also try our new Quiz Template if you want to set up something a bit more simple. The Quiz Template works like a personality quiz — the outcome with the most points is revealed at the end. Use the Quiz Template Now. A photo contest with voting is a smart way to encourage entrants to share your contest and increase repeat visits. After all, the more they share, the greater their chances of winning! Albert’s Diamond Jewelers did a wonderful job with their Valentine’s Day photo contest by encouraging their entrants to submit photos of people they love. This contest is a great way for users to show off someone special to them, creating an incentive for folks to share their entries. IDEA – Are you using voting to choose a winner for your contest? Use our Facebook ID restriction to limit the number of times users can vote. It’s one of the best ways to reduce contest fraud. Get Started with the Photo Contest Template. Is your target market more interested in planning a Spring Break trip than sending a dozen red roses? Whether you’re offering a free vacation, offering hotel specials or promoting travel accessories, folks are already planning their spring and summer trips. Awake created a neat sweepstakes to promote their Awake Caffeinated Chocolate Bar. By giving away a Spring Break trip for four to college students, Awake does a great job at marketing their product toward their customer base.